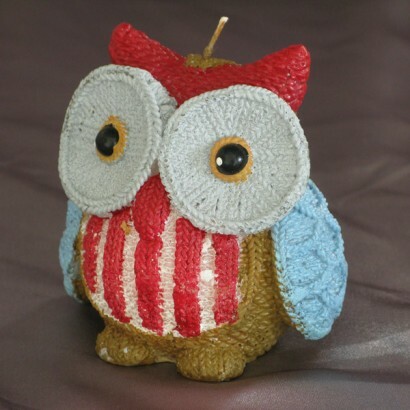 This Night Owl Candle has been cleverly designed to look as though it is knitted from wool. Wide grey eyes, a plump 'woolen' body and a stripy red chest make for a very sweet owl indeed. Each candle arrives individually wrapped and tied with a pretty red gingham ribbon, making it the perfect gift, if not almost too pretty to use! I bought this as a gift for someone and was very impressed by the detail when it arrived it certainly looks more expensive than it was. Such a fun candle- so impressive on the birthday cake!